My first experience with hair mousse was when I had the Watermelon braids style done for the first time. In simple terms (as if any hair term is ever simple), this hairstyle is a twist out done with extensions, and more often than not, finished with hair mousse. 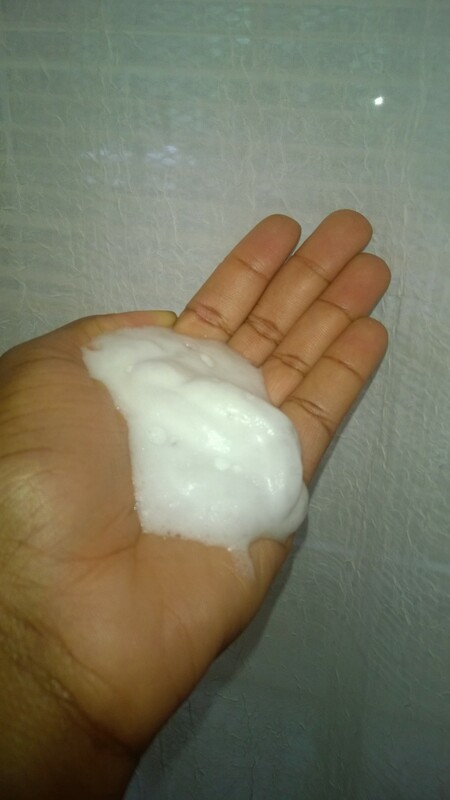 To maintain frizz-free curl pattern (and not merely as a way to get one to spend more money at the salon), it was adviced that I buy a can of mousse and use the fascinating, foamy contents regularly. But here was the problem that I failed to realise at the time: the more I used the foam, the dryer my hair and scalp got! There was also the annoying fact that it left white residue on my scalp. Plus, the thing was so sticky. Ugh! So naturally, to me, hair mousse was bad; no one should ever use hair mousse. Fast forward to last month. I finally made some professional looking DIY Marley twists (if I do say so myself) and a friend recommended I finish it with her mousse. Of course not! I wasn’t going to use that poisonous foam on my hard work. But then she promised me it was moisturising and it was from a line dedicated to natural hair. And so I grudgingly used it. I didn’t care enough to notice what it had done to my hair, the only thing I marveled at was that my palms did not feel sticky at all. 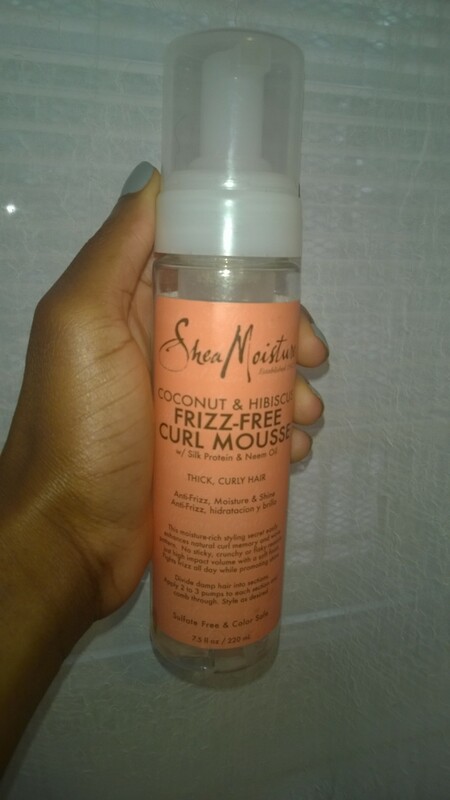 Enter Shea Moisture Coconut & Hibiscus Frizz-free Curl Mousse into my life. Apart from the nitty-gritty ingredients that I shall provide later on, this product prides itself in containing three major components to achieve its promise of moisturised, frizz-free curls. Now of these three, Silk protein and Neem oil, in terms of hair benefits, are new to me. So here is some education for people like me who have barely heard of these before now. aka Sericin, this protein is created during Silk production. Yes, silk, as in the threads that eventually get woven into fabric. 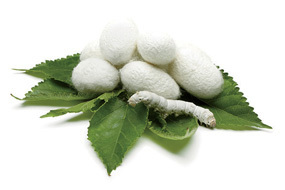 The way silk is structured, there are two major proteins responsible for its structure and properties. However, because you do not want to be bored with the details, basically, Sericin (our protein of interest) is the part of the protein that sticks all the tiny fibres together and is also responsible for the ‘shine’ that silk gives off. So how does this affects us? Well, apparently, this sericin has the ability to coat keratin, form a protective layer and prevent loss of moisture. Good guy, silk protein. This is why this protein is marketed for both skin and hair use, in terms of moisture. (Side Note: both skin and hair contain keratin). In addition to moisture retention, this layer formed by the silk protein gives the applied surface a luxurious feeling that is commonly described as ‘silky’. Neem is a tree. A tree that is specific to the Indian region of the world. 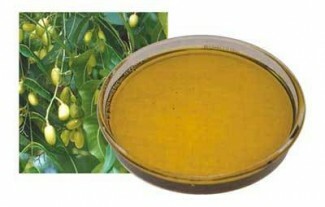 Neem oil is derived from the seeds of this tree. This Neem oil, which has been said to have uses in abortion; curing leprosy and intestinal worms, apparently has a strong odour best described as the love child of peanuts and garlic. In terms of hair, Neem oil has been paraded as a hero for almost everything, from relieving itchy and dry scalp, to stimulating hair growth. This anti-frizz, moisture & shine formula promises to help fight frizz while promoting shine without being sticky, crunchy, or leaving flaky residue. Deionized water, Coconut Oil, Vegetable Glycerine*, Olive Fruit Oil, Shea Butter Oil, Moringa Oleifera Seed Oil, Vegetable Glycerin*, Keratin, Polyquaternium-7, Hibiscus Sabdariffa Extract, Silk Protein, Polyquaternium-10, Sucrose Laurate, Non-drying alcohol, Neem Seed Oil, Proprietary Essential Oil Blend, Potassium Sorbate, Citric Acid. *Is there a difference between Glycerin and Glycerine? I haven’t been lucky with finding any. What did I find it does? It did not lie in its claims. The first thing that struck me was its moisturising prowess. Often times, laziness and time cause me to skip important steps to ensure my hair retains moisture, especially with extensions in. However, I find that using this mousse alone goes a long way in helping my hair stay as moisturised as it can get. In addition, it helped keep my braids’ day 1 aesthetic, especially towards the roots. I have no ‘buts’ when it comes to this mousse, and so I will go ahead and recommend it as a choice for styling. Now, my twists outs never work out and so I am never sure what to look out for, especially with rating a product’s impact on my twist-out. I assume this mousse will help eliminate frizz from twists-outs and any other natural hair style. However, I cannot testify that this has been the case in my experience. I got mine for $8.49 from a drug store. It is sold for 2,900 Naira here. Oh and it comes in a pump-lidded 220ml bottle. If you have used this product in the past, what have your experiences been? Love it or loathe it? I’d love to hear from you. I really love Shea Moisture products. Their shampoo and curl mousse work well for me. might try this. thanks! I think glycerin can be spelled two ways, so its the same thing. My hair in this lagos weather does not like glycerin, it makes me oh so frizzy 😦 . But in the cold weather their curl enhancing smoothie got me through with most of my curls intact!! Hi Mee mee, I assume you’re talking about trying to find vegetable glycerin to mix in your sprays and conditioners, etc. It’s very easily found in any supermarket. Just check the aisle with baking goods. It’s usually used in icing and fondant and whatnot. A 4 ounce bottle costs about 150naira and above, depending on the brand and packaging etc..
Shea Moisture products (with the exception of the gel souffle) are my go-to’s. I tried this product on a twist and curl and it came out pretty superbly. It was the most defined twistout I’ve been able to do on my transitioning hair. I have really coarse natural hair and this product managed to tame frizz long enough for my relaxed ends to blend with my natural hair.